Advantech WebAccess/SCADA is a browser-based SCADA software package for supervisory control, data acquisition and visualization. It is used to automate complex industrial processes for situations where remote operations are needed. In addition to traditional SCADA functions, WebAccess/SCADA features an HTML5-based intelligent dashboard that enables cross-platform, cross-browser data analysis. WebAccess/SCADA also provides open interfaces for developing IoT applications aimed at various vertical markets as industrial IoT platform, and it also acts as a gateway for collecting data from ground equipment and transferring the data to cloud applications via MQTT publish/subscribe. WebAccess/SCADA is a 100% web-based SCADA software application. As Advantech’s core IoT application platform, it provides a unique environment for development and remote maintenance, allowing access to and manipulation of data stored on a central server. This enables the configuring, changing/updating, and remote monitoring of equipment, projects, and systems worldwide via a standard web browser. WebAccess supports the following open real-time data connectivity: OPC, Modbus, BACnet, DDE Server and the following open offline data connectivity: SQL Server, Oracle, MySQL, and Microsoft Access Database. WebAccess supports over 200 device drivers. 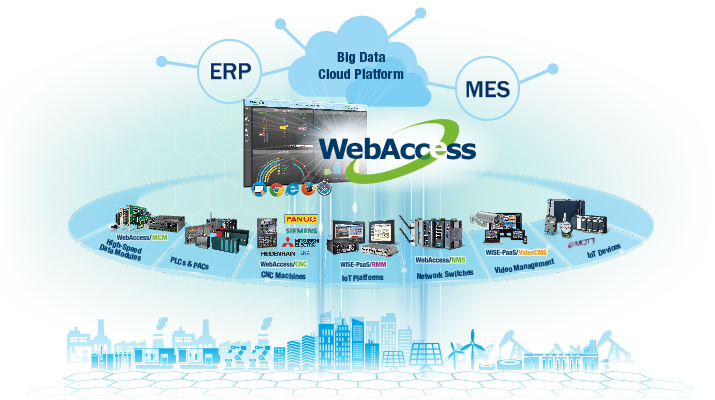 In addition to Advantech I/Os and controllers, WebAccess also supports all major PLCs, controllers and I/Os, like Siemens, Lon Works, Mitsubishi, Beck off, etc. WebAccess App is the new mobile app for WebAccess/SCADA 8.3 and above, with support for iOS 9 and Android 4.4 and above. With Node.js as the underlying data transport layer, data can be immediately transferred to phones. WebAccess/SCADA offers several types of interfaces, including RESTful API and SignalR, for various applications. With Web Service interface, users can integrate WebAccess data into APPs or application system. And, the pluggable widget interface has been opened for programmers to develop their own widget and run on WebAccess Dashboard 2.0. Enable WebAccess to act as an IoT platform for users to develop IoT applications in various vertical markets. For integration with third-party software, WebAccess/SCADA supports OPC UA/DA, DDE, Modbus, and BACnet server/client for real-time online data exchanges. Through the ODBC interface, WebAccess/SCADA can restore historical data in Microsoft SQL Server, Oracle, MySQL, and Microsoft Access for offline data sharing with MES or ERP systems. For edge computing application, WebAccess/SCADA also publishes real-time and historical data to private/ public cloud platforms via MQTT, thus providing a database for big data intended for use in cloud applications. WebAccess/Dashboard 2.0 comes with a dashboard editor for creating custom information pages that display analysis charts and diagrams. In addition to more than 40 built-in widgets, Dashboard 2.0 comes with Widget Builder, a widget development tool that aids users in creating unique widgets. Once dashboard screens have been created, users can conveniently utilize the dashboard viewer to access data from different devices via different browsers. WebAccess/SCADA integrates real-time data from physical sites with Google Maps and GPS location tracking. Users can easily associate their real-time site data with a marker and label by right-clicking on their Google Maps or entering the coordinates of the target. This function also integrates with GPS modules to track the location of the marker in Google Maps and allows it to be used in vehicle systems. WebAccess provides Excel Reports for fulfilling the requirements of self-defined report functionality. Users can build self-defined Excel templates and generate periodic report on demand reports automatically in Microsoft EXCEL format. The Excel Report function is also web-based and can be generated and viewed in a Web browser from wherever is needed. WebAccess/SCADA Real-Time Database (RTDB) is designed to meet industrial high speed and large quantity data access requirements. Just by enabling the usage of RTDB in WebAccess configuration page, WebAccess SCADA node can serve data processing at a scale of millions of records per second. Moreover, the RTDB maintenance feature automatically archives and deletes obsolete data. WebAccess/SCADA supports multitouch operation and various preset gestures, such as flick for page turning and zoom in/out, in addition to two-handed operation. This more intuitive handling style maximizes operating safety, increases usability, and reduces training time. Furthermore, WebAccess/SCADA also supports multipoint tap/grab/spread gestures to initiate predefined actions. Advantech’s WebAccess/SCADA ensures continuous reliable communication with automation equipment. The WebAccess backup node activates when the primary node is down. WebAccess/SCADA device drivers are designed to communicate with backup ports and devices whenever the primary connection is lost and to automatically restore to the primary connection when it becomes available. WebAccess/NMS is an HTML5-based network device management system that can be easily integrated with a web interface. Additionally, with WebAccess/SCADA graphics, users can examine event logs and monitor the real-time status of network devices in the network topology. Previously, WebAccess/SCADA supported only sensor and device monitoring. Now, with the integration of WISE-PaaS/RMM, it also provides support for monitoring of the status of equipment, such as the CPU temperature, CPU usage, and board temperature, thereby enabling remote equipment monitoring.